In school, you eagerly waited to lay hands on The Loyolite. Just because you left the school, why deny yourself the thrill? Download the 2007 School Magazine (.pdf; 4.1 MB). To read the Hindi section, download the Hindi fonts (.zip; 1.5 MB) and install them on your computer. The magazine on the whole, is well presented. It is no joke to accumulate so much content, and present it in a very creative manner. It has also got the right blend of the old (read alumni section) and the new. It was a wonderful idea to interview previous school leaders and find out what they’re doing. Inclusion of many photographs has enhanced the presentation substantially. However, there is room for improvement. There are a few factual errors. The magazine says that Mrs. Elaine Jobe started teaching in Loyola in 1968 (actually it’s 1988). Tojo Eapen is from the SSLC 1992 batch, not ICSE 1992. There are quite a few spelling mistakes, something that is unpardonable by Loyola’s standards. But overall, I feel that the magazine has gotten much more interesting and personal when compared to the time I used to be a student. My name is Vineeth and as u have read the article about the former school-leaders and spotted a mistake, I think u might remember my name as the author. Let me first apologize for that grave error, and now let me tell you how that came about. This project was an idea of D.P and she entrusted me to do this 2 years back when I was in the 11th(I’ve passed out of school this year). I delayed giving in the article with the hope that I might be able to get through 2 a few more school leaders. In the end with my board exams bearing down on me, I had to give in all the data I collected to DP and entrust it with my juniors who did the magazine. When I got thru 2 the school leaders and asked them what we wanted to know, I made a mistake of not asking them which section(ISC,SSLC or ICSE) they belonged to….I felt the year would be enuf coz the school leader stands for the whole senior batch of that year and not just for his class, doesn’t he?…But the guy who edited the data I sent 2 DP(I dunno who it is) didn’t think so and he made that error of taking Tojo Eapen to have been in the ICSE stream. My sincere apologies to Tojo Eapen and to everyone else. Thanks for the detailed response. My overall opinion of the magazine is very positive. Especially so, about your Q&A with the former school leaders. As you mentioned in your response, a few errors may have crept in because you (I mean, the student editors) did not have complete control over the publishing process. But still, fantastic effort, bro! Ashok, thanks a lot for putting this up. The Loyolite was the first time I was on any editorial board and I think that was the best way to start. I’ve been to your blog a few times and I absolutely love the content. Keep it up. Being one of the the authors of the article “Back to the future”, let me assure you that Mrs.Elaine Job joined the school in 1968. During the interview with her we had clarified all the data that has been given in the article. She joined the school in 1968 and taught for some time before she got married and left for Abu Dhabi.She then returned to Loyola after losing her husband in 1988. Hmmm… that is quite incredible, then. 1968 was when Loyola’s first batch graduated. So Mrs. Job has seen Loyola in so many different stages. When she returned in 1986, she replaced Mrs. Ponnamma Mathew (who moved on to 5A) as class teacher of 4A. She was my mathematics teacher in 3A (1986-87), and class teacher in 4A (1987-88). She never mentioned to us that she had done an earlier stint in Loyola. Wow, she must have been fresh out of college when she did her first stint. Thanks for the quick clarification, Gejo. I stand corrected. Ashok, thanks for link to the Loyolite. Really felt the old schoolboy thrill again reading the school magazine after close to a decade. 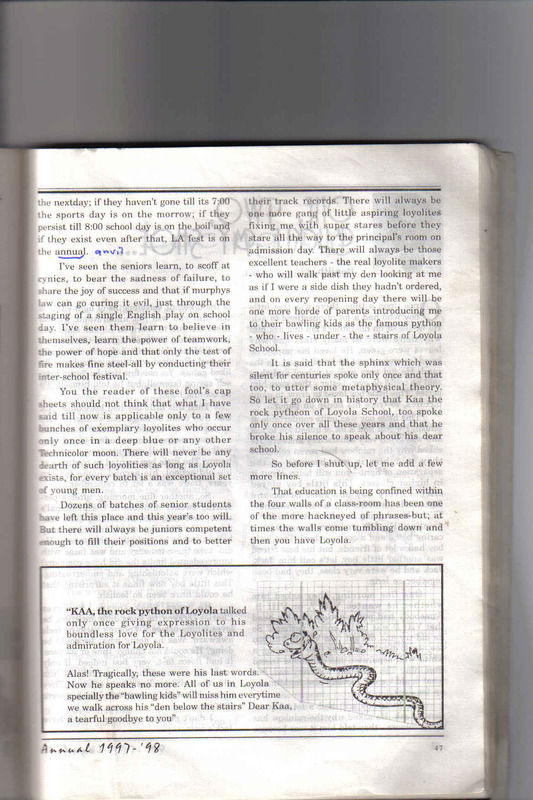 The Loyolite was the first and only time I got my writing published in print, that was in the 9th standard, but I never had the confidence to write anything since then for a long, long time. The section on past school leaders was awesome to say the least. Infact I am a benificiary of an earlier such initiative in 1998 when Ben George who was School Leader in 89-90 wrote a great article for the Loyolite. 4 years later in 2002, I was ‘Fresh off the Boat’, homesick and friendless in Los Angeles, I came to know of a malayali, Ben, who also studied in my same university. He rang me up and we traced our ways back to Trivandrum, and then he to medical college and me to engg college, and then miracle of all miracles, both of us to…Loyola!!! This should be a regular feature in the school mag as it helps Loyolites of different ages to connect with each other. 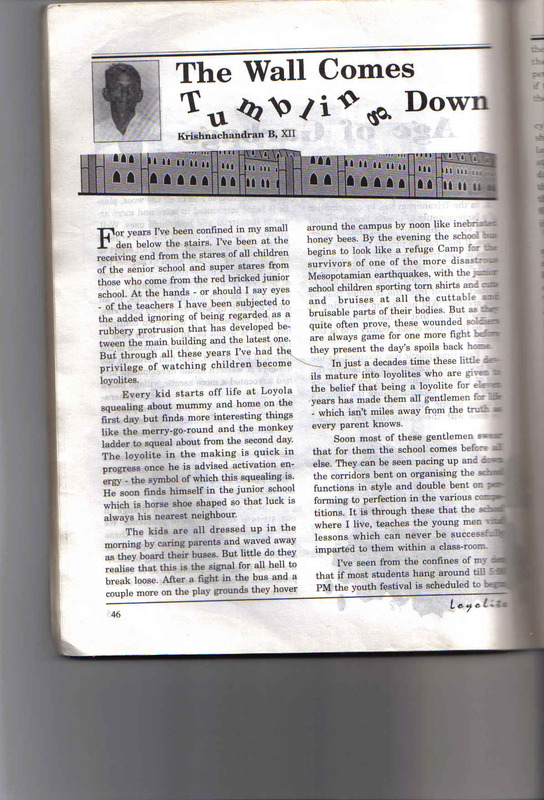 For all Loyolites visiting this page, I am posting a link to an article which is my favorite for all seasons, that appeared in the ’98 Loyolite, by Krishnachandran who was School Leader then. All of us ex-Loyolites, particularly those who are not in touch with the current students need to thank you from the bottom of our hearts for your terrific effort!! Thanks for giving all of us a chance to see “The Loyolite” of 2007. The magazine sure has changed. It’s far more savvy than it used to be in our days. It’s just by chance that I came across your blog today and need to thank my stars!! Have spent a great amount of time today reading all your posts. You guys really ROCK!!! I’ll be visiting your postings very often in the future. My Best Wishes to all of you guys!! I need to mention a quick word of thanks to Vineeth.. I know the way he really followed up (should I be using the word “hounded”?) for responses from all us old, lazy guys. It’s been 25 years since I passed out of Loyola. Let me tell you guys, it’s the best thing that happened to all of us.. We passed out of the gates of one of the greatest institutions. Reading through the Loyolite today brought back lots and lots of great memories!! Issac, Jiby, Uday: Thank you for the kind words. This year’s school magazine is what wannabe historians like me yearn for. I wish the older magazines too were of the ‘news from school’ genre. Having gone through 13 years worth of Loyola school magazines (and 5 more 2 years back when i was among the editorial board), i have to admit that this was one of the best i have read. Deepa ma’am has truly given her best shot at the last magazine she would be in charge of. That piece on Abdul uncle seems so touching. The editorial board and DP surly deserve words of praise from all of us. Heh i think il hear more about that at the AGM. And i was witness to all the work that my classmate vineeth did to dig up all that stuff on the past school leaders. DP’s idea was to find all of them(Hey did you know.. all of them are still on earth). And 2 years he spend on that starting with writing down the names from the roll of honour hanging in the office.I remember suggesting batchmates.com and remember finding two people there. I do not remember who. And near the end of twelth he had to give it up because our boards were disasterously near. Still tremendous effort dude. cheers. hope to seeeyas all at the AGM.. Very well done. Congrats to all involved in this effort. Uploading the soft copy is a great step – enables access for everyone from anywhere around the world. Thanks for catching the correction regarding my batch. No apologies required.. It might also be a good idea to upload a copy (could think about a specific link for digitized magazines from the past and the future) on the school website – esp. for those who might not be aware of Ashok’s blog. The school website could also have a link that highlights renowned alumni around the world. I understand it’s really difficult to balance – would it be a good idea to shorten the overall size (pages) of the magazine? Syam, yes, I too found the article on Abdul Uncle touching. Tojo, I think the solution is to put a link to my blog on the school website. 😉 I was able to upload the soft copy due to a nameless/faceless one, and Vishnu Gopal. Narayan, thank you. If somebody raises the money, we could put all past issues online. It was a mix of emotions that welled up going through Loyolite 2007. The faces I knew -Uday ( my class mate, Mrs Murray, Mrs Grace, Ms Ranjini (teachers in junior school), Atul. It was a pleasurable trip down the memory lane. The magazine definitely has gone great deal ahead in terms of content and quality. Though I had visited the school a few years back, it was indeed an experience reading the magazine page by page. It is a good achievement by the magazine group. Though it was by chance it is something really good to have bumped into this site today. Sandeep, yes, content-wise, there is much more ‘Loyola news’, which is what Old Boys yearn for. The magazine is also slicker than in the past — glossy paper with loads of colour, unlike the plain/dry B&W ones of the 1980s. I am indeed very happy that all those time I spent last year at school in the Vacations paid off. As I can see here, the mag came out to be better than expected. But needless to say, there was also one invisible hand, another Loyolite, in the rendering of certain graphical sections of the magazine. The person happens to be my younger brother Niketh, now about to finish 10 ICSE. He was my helping hand in preparing the artwork for the Trivia about Loyola(p47), and the Sketches in ‘Species of Loyolites'(p48), and was not, sadly, acknowledged. Nitin, thank you for bringing Niketh’s role to the forefront . Thanks for taking time to post that Magazine!! AWESOME effort. And man, what a blog you got here?? Love your effort mate!! Keep going!!! I love Loyola to the core!!! It was the foundation for whatever little I’ve learned and I take pride in saying that I am a Loyolite. Radhakrishnan, glad to hear that you enjoyed this blog. Talking of teachers, I now have a controversial post on the teachers (including some of who you mention) — Why Lady Teachers are Best When Young. I loved to read through the highly informed opinion of the seniors on the last year’s school magazine.I would like to know thier opinion on this year’s magazine.My compliments to Ashok chettan on his commendable effort put in on this blog.He has helped loyolites transcend barriers of age and distance by putting up and maintaining this enjoyable blog. BRAVO! Umm….i was wondering if you could be nice and send me the font that you used and ….which software did you use to make this?? Sry to disturb u guys……!! We had to make a magazine and i luved your font so wanted it nad the software used to make….